Welcome to North Myrtle Beach, South Carolina and welcome to a wonderful oceanfront North Myrtle Beach vacation at Ocean Pier III. 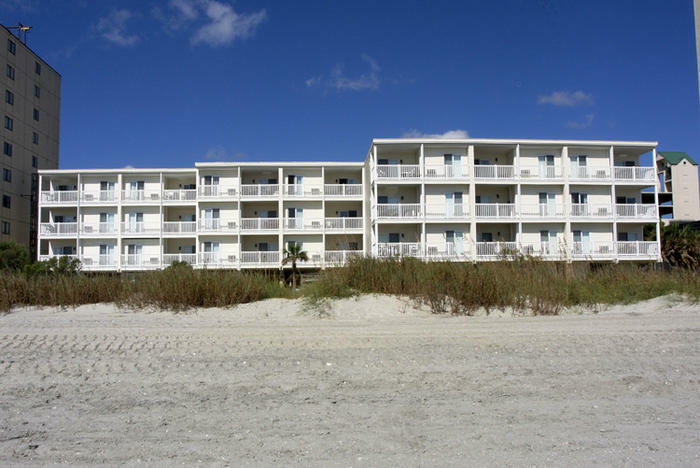 Nestled on the beautiful white sandy beaches in the Windy Hill section of North Myrtle Beach, South Carolina, this oceanfront resort is three levels of North Myrtle Beach condominiums built on stilts. An oceanfront swimming pool is a wonderful amenity at this North Myrtle Beach resort and most of these North Myrtle Beach vacation rentals have direct oceanfront views. Come make yourself at home at Ocean Pier III. A North Myrtle Beach vacation at Ocean Pier III means your family will be centrally located to all of the wonderful amusements and attractions that make the North Myrtle Beach and Myrtle Beach areas so popular. Myrtle Beach golf, live entertainment theatres, more than 1,500 restaurants, shopping and water sports are found throughout this seaside resort town. So you will have the time of your life doing whatever it is your family is most interested in doing during their North Myrtle Beach vacation. And at the end of a fun-filled day you can retreat to your comfortable accommodations at Ocean Pier III for a good night’s sleep. The North Myrtle Beach vacation rentals at Ocean Pier III are all two-bedroom, two-bath condominiums. There is room for six people in each of these North Myrtle Beach rentals as the sleeper sofa in the living room accommodates two people quite comfortably. There are numerous window air conditioners in these condos in North Myrtle Beach, South Carolina so each room can have its own temperature. In these nicely decorated North Myrtle Beach rentals you will find a kitchen that comes equipped with full-size appliances, cookware, dishes and utensils. Cook as much or as little as you want when you vacation at Ocean Pier III. The kitchen is a convenience that is there for you. Keep some cereal on hand for the kids and some lunch meat in the refrigerator for a quick sandwich at noontime. Having a dishwasher and an oven and a full-size refrigerator instead of a cooler makes a world of difference, especially when you have kids on vacation with you. Each of these condos in North Myrtle Beach, South Carolina has Internet access. Having the option to bring your computer and get online during your North Myrtle Beach vacation can mean a great deal to some folks. You can also use the Internet access to look at restaurant menus as you try to decide which venue is best suited for your family. There are so many from which to choose that having a chance to see the menu beforehand could save you valuable time on your North Myrtle Beach vacation. Elliott Beach Rentals is not affiliated with onsite management or the HOA of Ocean Pier Iii.